Put a nickel in the drum, save another drunken bum! Put a nickel in the drum, and you'll be saved! My mom tried to convince me that it would be much nicer if we sang it as "Put a nickel in the tin, save another soul from sin," but have you ever tried to convince a group of teenage boys to do the nice thing? Yeah, right. So, anyway, I have some karmic debt to repay to the Salvation Army. My dad was actually a big supporter of the SA, doing lots of volunteer work with them for several years. 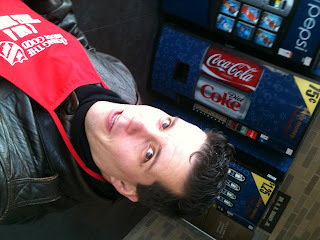 I decided that I would serve them today as that most iconic of Christmas sights - a bell ringer outside of a store. And so it was that I showed up outside of WalMart a few minutes before noon to relieve James, the ringer who'd been there all morning. There's not much to it - James gave me his red apron and his bell, phoned the coordinator at Salvation Army to let her know we were switching, and then took off. I started ringing. Smile and wave at kids as they enter the store with their moms. Enjoy that this WalMart is close to Tech, so you get to watch lots of cute college girls coming in. Count all of the people wearing UT gear. Wonder how many of them actually went to UT. If the bell should happen to slip out of your gloved hand and drop to the ground, pick it up and say to whoever is nearby, "Aw man, now I've gotta start all over..." and then count out loud as you start ringing again. Remember that you know a word that means "the ringing or sounding of bells": tintinnabulation! Watch cute college girls walking back out again. Whenever somebody on a cell phone walks past you, ring your bell louder and more unceasingly. Just go crazy with it, like Will Ferrell on a cowbell, and see how many of them have to ask whoever they're talking with to repeat themselves. I'm here to tell you that people do still drop money in those kettles. I couldn't keep any sort of count while I was out there, but a lot of people dropped in at least some change, and quite a few tucked folded bills in there. James came back from his lunch, we switched back, and I wished him well before heading back to the office. I actually thought that I was smiling when I self-shot this picture, but I was so cold that I may not really have been able to feel my face. More than once, I thought that I should have worn a hat, but it doesn't seem right when I'm doing public service to deprive the public of the sight of my hair. You don't hide your light under a bushel! Plus, it's the only part of me in this picture that doesn't look like The Ghost of Christmas Yet to Come. Gratitude Project: Tonight is my company Christmas party, and I'm really looking forward to it. Vista Bank always puts on a really fun party. I'm thankful to work with good, strong, honest people, and to have an employer who has always treated me fairly, and allowed me to put my family first. Not to mention the fact that they don't get on me when I occasionally need a lunch break a teensy bit longer than an hour in order to do a service project. My grandmother (born 1901) used to sing that version after her "after dinner drinks." I never knew you were so cool Danny!